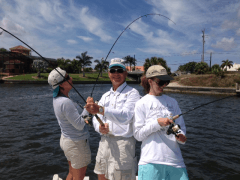 Fishing the Sanibel and Fort Myers area is a great way to relax on your vacation. The waters of Pine Island Sound are teaming with different species waiting for your fishing line to hit the waters. Lately the fishing has been like the roller coaster rides we remember as a kid. The weather has been anything but predictable. Non typical rain patterns and lots of wind but fishing this coast is in my opinion the best place to get out even on bad weather day. We have lots of Island to find the Lee side of, and lots of creeks to tuck into to be able to turn a “would be cancellation” into a day to remember. So be the case with my old friend and author of “Drawing Dead” Ben Shelfer. Ben called to have a day out with his girls, Angel and Karen. 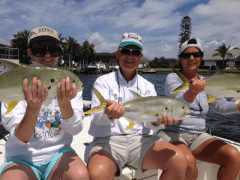 We’ve fished before, but Ben heard about some hard fighting Jack Crevalle that I’ve been on, and wanted a piece of the action with his daughters. So let the fight begin. We chummed them up and presto, magic we were in them. Jacks are pound for pound, one of the toughest and most aggressive fished I’ve ever seen. They hit bait, flys, topwater lures and sometimes the kitchen sink (if you can get it out there)! We had multiple triple hookups, and some funny episodes to remember for a lifetime. Thanks Ben, Karen and Angel for a day to remember! Hope to see you soon.